Planning permission has just been granted this week for a new free-standing community classroom block on the site of Hatfield Community Free School. School staff appointed PCMS Design when realised they needed a building close to existing playing fields to serve as additional classroom space, and also to provide some shelter and changing areas for the adjacent pitches. Our feasibility process identified a suitable site, a concept design was approved, and we negotiated with the Planning Department at Welwyn Hatfield District Council to iron out a number of planning issues prior to permission being granted. Care has been taken to design a building which reflects that of the existing school, which was constructed 5 years ago. The wish is to proceed with construction as quickly as possible, in order to provide much needed classroom space. This entry was posted in development, planning consent, planning permission, School Construction, school extension on April 28, 2017 by admin. It can be surprising how quickly the installation of new classrooms can be turned around when the need arises. 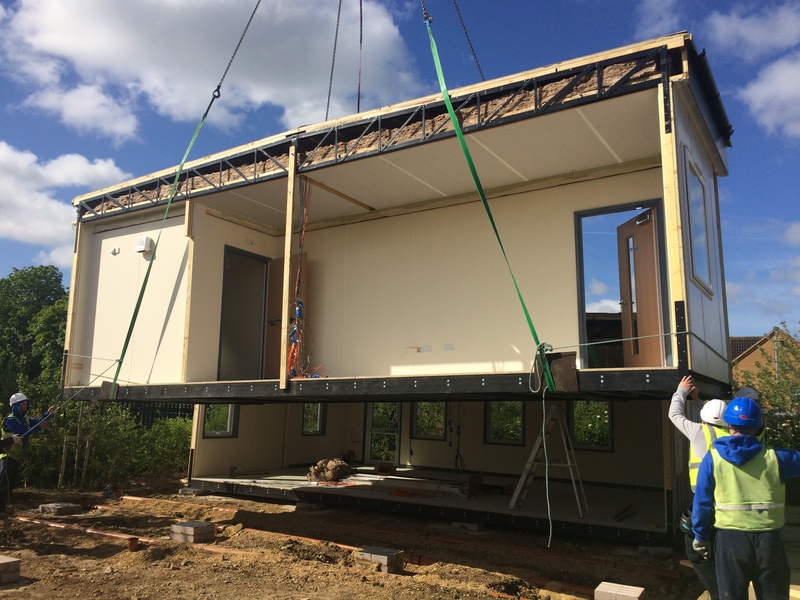 In the case of this Bedfordshire school, once planning permission had been secured, the instruction to proceed was given to a specialist modular contractor who took only a month from factory build to installation on site. PCMS Design staff had visited the factory only a couple of weeks previously to see the seven modular bays being manufactured and fitted out, so it was satisfying to see them being lifted into position so quickly. Two classrooms each measuring 56m2 will be available, plus a 42m2 group room, WCs and storage. Quality standards have been maintained throughout the manufacturing process, and the resulting building will deliver excellent insulation properties and performance. The modular option offers a cost-effective and quick solution for schools (or businesses) requiring additional space in a hurry. This entry was posted in Bedfordshire, classroom, construction, modular unit, School Construction, school extension on April 27, 2017 by admin. A new vacancy has arisen within our team for an experienced Architectural Designer / Building Engineer. The successful candidate will have a university degree or equivalent qualification in the field of architecture, architectural technology, engineering or building surveying, and a minimum of 2 years direct work experience in a building design capacity, including aspects of planning and specification. A good working knowledge of current construction techniques, UK statutory requirements (Building Regulations, Building Bulletins, CDM Regulations, etc) and non-statutory design guidance is essential, in addition to demonstrated experience in CAD. The experience of working both independently and in a team is important. The ability to effectively prioritise and execute tasks in a time-constrained environment is crucial, as are strong interpersonal skills. We are flexible about full-time or part-time hours for the right candidate, and would also consider freelance candidates. To apply for this vacancy, please email your CV with a covering letter explaining why you will be a good fit for this position and stating salary expectations. This entry was posted in architectural technologist, Job Vacancy, vacancy on April 21, 2017 by admin. 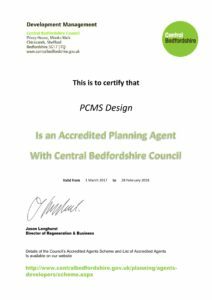 For the third year running, PCMS Design has achieved the status of ‘Accredited Planning Agent’ with Central Bedfordshire Council (CBC). This scheme has been created by the Council to recognise continued regular compliance with planning regulations, and also adherence to CBC’s standard Development Management guidelines when submitting planning applications. To qualify, all applications must be submitted in an accurate and timely manner, with the relevant amount of detail and the correct accompanying information. Staff from PCMS Design regularly attend planning seminars and consultation sessions at the Council offices, and also have a good working relationship with officers from the local authority. We look forward to this continuing over the forthcoming months, as there are a number of planning applications in preparation for submission. This entry was posted in CBC, Central Bedfordshire Council, planning advice, planning consent, planning permission on April 10, 2017 by admin.